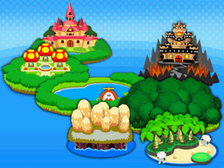 Blubble Lake is a location from Mario & Luigi: Bowser's Inside Story. It is west of Bumpsy Plains, north of Cavi Cape, and south of Toad Town. The area is a huge lake with many rock structures and stone walls. The area is first traveled by Bowser on his journey and later by Mario and Luigi. The area can be explored both on ground and underwater by use of a special device. 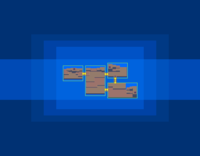 However, the only enemies underwater are Crawfuls. There are also special flowers that release pollen in the area. 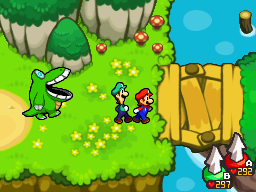 If Bowser sniffs the flowers, Mario and Luigi will have to travel to the Nose Deck to make Bowser sneeze. When Bowser sneezes, he creates huge gusts of winds that can move objects and solve puzzles. This can be used to move the old and abandoned ship nearby. The Tower of Yikk is located here, as is Broque Madame's house, where Bowser can practice Special Attacks in exchange for gear. Bowser can also obtain the special attack Koopa Corps here. Squid Fit is used extensively in this area. There are two Blitties hidden in Blubble Lake, one found inside a Crawful, and another one inside a Beehoss. Here is a list of overworld items found in this area in Mario & Luigi: Bowser's Inside Story. Other items can be collected from enemies and Broque Madame's minigames. Super Mushroom x2 In a ? Block near the Cavi Cape exit (or one scene east of the southwesternmost). 1-Up Deluxe In a ? Block in the southeastern scene of the four in the northwest. Hot Drumstick x4 In a brick in the middle scene underwater. Fiery Drumstick In a brick in the scene where the Koopa Corps is trapped (and where the ship ends). Super Nut In a ? Block in the southwestern scene of the four in the northwest. Supersyrup Jar In another brick in the middle big beachy area. x2 In a brick in the scene on the right of the lake area. In a brick in the northeastern scene underwater. Star Candy In a ? Block in the tree hole in the east of the map. Retry Clock In a brick one scene to the left of the Tower of Yikk. Brawny Wear In a ? Block in the southwesternmost scene on the map. Deluxe HP Socks In a ? Block in the tree hole in the east of the map. Fury Fangs In a brick in the middle big beachy area. Luxury Patch In a ? Block in the scene to the northwest of the Tower of Yikk. Rampage Shell In a brick in the northeasternmost beachy area. There are 21 Beans in this area. Zutsūda Reiku Lake Headache; from zutsū, meaning headache. French (NOE) Lac Boboteth With lac (lake) and what seems to be a pun on bobo (scratch) and tête (head). When Bowser first visits Blubble Lake, upon using the Save Block, the description saved with the file contains a typo. Bowser's name is misspelled as "Boswer". This page was last edited on December 27, 2018, at 22:20.